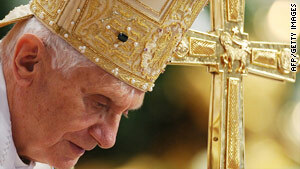 Pope Benedict XVI leaves after leading mass on the opening of the Synod on the Middle East at St. Peter's basilica. (CNN) -- A Catholic conference aimed at strengthening Christian communities in the Middle East opens in the Vatican Sunday. The gathering follows a warning from the Catholic Church that "with the rise of Islamic fundamentalism, attacks against Christians are increasing almost everywhere." "Oftentimes, relations between Christians and Muslims are difficult, principally because Muslims make no distinction between religion and politics," the Church said in June in outlining the purpose of the Synod of Bishops Special Assembly for the Middle East. "The Muslim world's reluctance to make the distinction between politics and religion is bringing great harm to the Church in the Middle East, because, realistically speaking, Muslim public opinion associates the Church with whatever political choices are made by the states in the West," the Catholic Church said. The Synod aims to support "in particular those (Christians) who live in difficult situations because of violence, terrorism, emigration and discrimination," Archbishop Nikola Eterovic, secretary general of the Synod of Bishops, said Friday. The Synod will bring together Catholic bishops from the region, plus leaders of other local Christian churches including the Copts, Maronites, Chaldeans and Armenians. The Middle East is about 1.6 percent Catholic and about 5.6 percent Christian, said Archbishop Nikola Eterovic, secretary general of the Synod of Bishops. The Synod is scheduled to run until October 24.